CDC WANTS TO EXPAND POWER TO ELIMINATE MEASLES – WHAT YOU NEED TO KNOW | "Global Possibilities"
I remember the day in 2007, when I was standing in front of a Maryland country courthouse videotaping interviews with mothers and fathers lined up with children, who had been thrown out of school for failing to show proof they had gotten chickenpox and hepatitis B shots. State public health officials were threatening the parents with fines and jail time and suddenly, as we were talking, men in uniforms with guns and dogs emerged from the courthouse and headed toward us. In the pit of my stomach was the sickening feeling that people in countries throughout history have felt when the exercise of freedom of thought, speech and conscience is met with a demonstration of police power wielded by agents of the State. Read this referenced commentary and watch a video or post a comment. Read NVIC’s Sept. 13, 2016 press release on the CDC’s proposed law change here. Wearing red shirts and “Freedom, Conscience, Religion” buttons, more than 400 Virginians drove and bused to the state Capitol to attend an Aug. 3, 2016 health subcommittee meeting of the Joint Commission on Health Care (JCHC) in the VA legislature. The parents and grandparents showed up to oppose a proposal to eliminate medical and religious vaccine exemptions. Virginia has a 1.1 percent vaccine exemption rate for kindergarten children statewide. A bill was introduced in January 2016 (HB 1342) to eliminate vaccine exemptions but encountered stiff citizen opposition before it was withdrawn for further study by the JCHC. 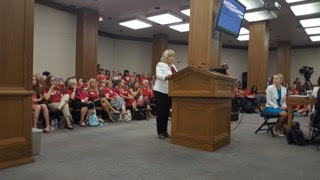 The JCHC subcommittee invited Voices for Vaccines (VFC) to give an oral five-minute statement supporting the bill at the Aug. 3, meeting, which was delivered by VFC spokesperson Karrie Delaney, who is running for VA Delegate. NVIC was invited to present an opposing statement, which was given by NVIC Co-founder and President Barbara Loe Fisher. The JCHC staff presented an hour-long report that ended with a request for public comment. At a Sept. 7 JCHC meeting, the staff reported that only five out of 800 emailed public comments supported eliminating vaccine exemptions, while 674 comments requested no action be taken to change VA vaccine laws. The American Academy of Pediatrics recommended eliminating vaccine exemptions while the VA Department of Health, NVIC, Virginian’s for Medical Freedom, Center for Medical Freedom, Children’s Medical Safety Research Institute, The Family Foundation and Home School Legal Defense Fund recommended no change to the law. The JCHC will vote on Nov. 9 whether or not to recommend to the legislature that vaccine exemptions be eliminated. Become a user of the free NVIC Advocacy Portal to stay up to date on new developments on vaccine-related bills in Virginia and other states, as well as in Congress. States Make It Harder to Skip Vaccines. As state legislatures continue attempts to restrict vaccine choice, NVIC’s co-founder Barbara Loe Fisher said parents should be able to decide whether their kids can be vaccinated. Fisher said, “Eliminating exemptions would mean that unvaccinated children in many states wouldn’t be able to attend school.” Valley News May 29, 2016. PAC Mobilizes To Defend Vaccine Exemptions In Texas. Texas legislator Jason Villalba’s bill to restrict vaccine exemptions is caught in the crosshairs of a local political action group seeking to unseat the Representative Villalba. Veteran Texan vaccine choice advocate and NVIC’s Director of State Advocacy, Dawn Richardson noted that the vaccine choice movement continues to grow and that this new group is part of the new generation of vaccine choice advocates. She said, “In the political cycle, this is very much a one-issue determinant for who people sometimes choose to vote for. This something that is that strong for families. It is the health and well-being of their children.” KERA News Apr. 4, 2016. Child vaccination debate surges during VA’s Legislature Joint Commission Meeting. A sea of red overwhelmed a meeting of the General Assembly’s Joint Commission on Health Care on Wednesday after protesters came out in droves to oppose possible plans to restrict exemptions to otherwise mandatory immunizations for school-age children…The opponents of the failed bill – mostly wearing red in solidarity at Wednesday’s meeting – consisted largely of mothers with infants, toddlers or adolescents. They were there not only to show their opposition but also to support Barbara Loe Fisher, president of the National Vaccine Information Center, a Sterling-based organization opposed to mandatory vaccinations…”Utilitarian health policies that force everyone to be treated the same are cruel and immoral,” she said. Richmond Times Dispatch Aug. 3, 2016. Va. Lawmakers Accept Public Comments on School Vaccine Law. The Virginia Department of Health recommends taking no action, meaning the commonwealth would keep current medical and religious exemptions in place. Kathi Williams and Vicky Pebsworth, Director of Research and Patient Safety for the National Vaccine Information Center, attended the Sept. 7, 2016 briefing. They say they were pleased with the outpouring of comments against changing the law. “Under some of the proposals that had been floated, he [son] and most of the rest of the other children that I know who have medical exemptions would’ve lost their medical exemptions, and I don’t know what we would’ve done,” NBC29 Sept. 7, 2016. CDC Recommends against Nasal Spray Flu Vaccine. The CDC’s advisory committee voted not to recommend the nasal influenza vaccine, FluMist for the upcoming flu season due to poor effectiveness. NVIC’s president and co-founder Barbara Loe Fisher said, “It is shocking that government health officials have devised a National Vaccine Plan that lobbies for every single American to get a flu shot from cradle to the grave before the real science is in. Putting vaccine policy before the science is bad public health policy. Conducting uncontrolled vaccine experiments on people, who have been taught to believe and trust government health policy and now are being forced to obey strict ‘no exceptions’ vaccine laws, has far reaching consequences.” ProCon Aug. 16, 2016. On our website you can make a report to NVIC’s 33-year old Vaccine Reaction Registry and/or publicly post a vaccine reaction report with a photo on the Memorial for Vaccine Victims. News and opinion about what is happening when it comes to vaccine science, regulation, policy and law that will affect you and your family is being reported and talked about every day by more than 175,000 fans on NVIC’s Facebook page . Also, make sure you, your family and friends are receiving NVIC’s free weekly journal, The Vaccine Reaction and the free NVIC Newsletter published monthly. And don’t forget to become a registered user of the NVIC Advocacy Portal and take action in your state to protect your legal right to make voluntary vaccine choices.